Vijayadashami also known as Dussehra is an important Hindu festival celebrated in a variety of ways in India. 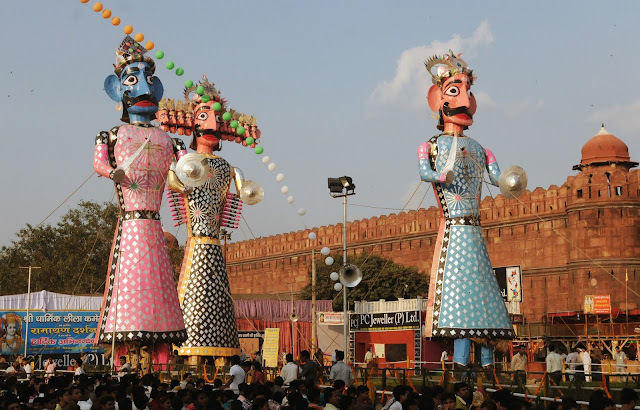 "Dussehra" is derived from Sanskrit; Dasha-hara is a form of Dashanan ravan ("Ravana's defeat").The day marks the victory of Durga over the demon Mahishasura. The goddess fought with evil for ten days and nine nights. "Vijayadashami" is derived from the Sanskrit vijaya-dashami (victory on the dashami: the tenth day of the Hindu month). On this day Ram (the seventh avatar of Vishnu) killed Ravan, who had abducted Ram's wife Sita to his kingdom Lanka. Ram, his brother Lakshman, their disciple Hanuman and an army fought a battle to rescue Sita. The story is recorded in the Hindu epic, the Ramayan. Wishing on this most Auspicious, Divine, Sacred, Spiritual and Devotional occasion of "DUSSHERA/VIJAYADASHAMI" TRIUMPH OF GOOD OVER EVIL today BY ALMIGHTY GODDESS MAA DURGA OVER DEMON MAHISHASUR AND BY ALMIGHTY BHAGWAN SHRIRAM OVER DEMON RAVANA AND , to all my Friends, Near and Dear ones, Family members, Sisters and Brothers, all my Relatives, Loved ones, My Blog Readers, My Blog Visitors, My Blog Voters, Everyone and to All of You Living in Every Nook and Corner of INDIA and also Living All Over the GLOBE " A VERY HAPPY DUSSEHRA--VIJAYADASHAMI" AND "MAY LOVE AND BLESSINGS OF SUPREME GODDESS MAA DURGA AND ALMIGHTY BHAGWAN SHRIRAM REMOVES ALL OBSTACLES IN YOUR WAY AND LADDER OF SUCCESS AND BLESS YOU AND FILL YOUR LIFE WITH HAPPINESS, JOY, PEACE, LOVE, ETERNAL BLISS AND PROSPERITY ON DUSSEHRA--VIJAYADASHAMI AND ALWAYS."